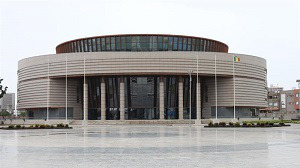 After being first proposed by former Senegal president Léopold Sédar Senghor 52 years ago, the country has opened the Museum of Black Civilizations, one of the largest museums of its kind in the world. The building is similar in size to the National Museum of African American History in Washington, D.C., with 14,000 square meters of floor space and ability to hold spaces for 18,000 exhibits, according to OkayAfrica. The museum was inspired by spherical traditional homes native to Southern Senegal. The plan to open the museum was put into motion by Senegal’s current president Macky Sall in 2013 and with the help of a $34 million investment from China was able to hit the ground running. The museum is devoted to “decolonizing African knowledge” and houses artifacts and exhibitions from both continental Africa and its diaspora, OkayAfrica reported.